Feb. 14, 2018, © Leeham Co.: The Boeing-Bombardier trade fight isn’t over, yet. The parties received on Feb. 9 the written decision by the US International Trade Commission and the public version, redacted of confidential and proprietary information, will be released March 2. Boeing is deciding whether to appeal its loss to the Court of International Trade or NAFTA. But this isn’t the only trade issue on the table. The Seattle Times last Sunday detailed Boeing’s current thinking that it has Airbus at a looming disadvantage. The same article quoted an Airbus official claiming the EU’s nuclear button is bigger than the USA’s in this trade fight. ”The U.S. government could then slap punitive tariffs up to that amount on whatever EU goods it selects for maximum political impact,” The Times reported. This means any tariffs could be assessed on products that are not associated with Airbus or Boeing, a mechanism that can mug innocent parties to the trade dispute. It also means the US Trade Representative could seek to impose tariffs on imported Airbus aircraft. If the WTO upholds a separate ruling that the billions of dollars in tax breaks given by Washington State in 2003 for the assembly of the Boeing 787 are illegal, which the US appealed, the EU would be free to impose tariffs on unrelated US goods or on Boeing aircraft. 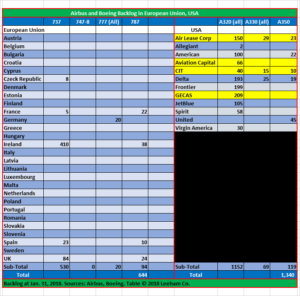 LNC checked the Airbus and Boeing web sites for the current backlogs in the US and the EU. The table below does not list Unidentified customers or their countries. The companies report their backlogs differently. Boeing lists by country, making an EU check easy. Airbus lists by customer and region, but not country (although in this case, only US customers are relevant). The Airbus customers highlighted in yellow are lessors. Although lessors boost the Airbus backlog considerably, not all Airbus aircraft might be imported to the US by lessors and therefore would be exempt from tariffs. It should also be noted that CIT is now part of the Irish lessor Avolon and probably no longer qualifies as a US company. However, Boeing may have hoisted itself a bit on its own petard. In the Bombardier complaint, Boeing conceded that the Airbus final assembly line in Mobile (AL) produces US-made aircraft. Since the Mobile plant is intended to produce for the US market, these aircraft would appear to exempt for any tariffs. Some of the A320 family airplanes may still be scheduled to come from Airbus plants in Hamburg and Toulouse so the precise number that theoretically are potentially subject to tariffs is unknown. Likewise, the number of lessor-owned aircraft destined for US airlines is unknown. Excluding the A320s and the lessor-ordered wide-bodies, there are 112 known wide-bodies destined for US airlines that potentially could be subject to tariffs. 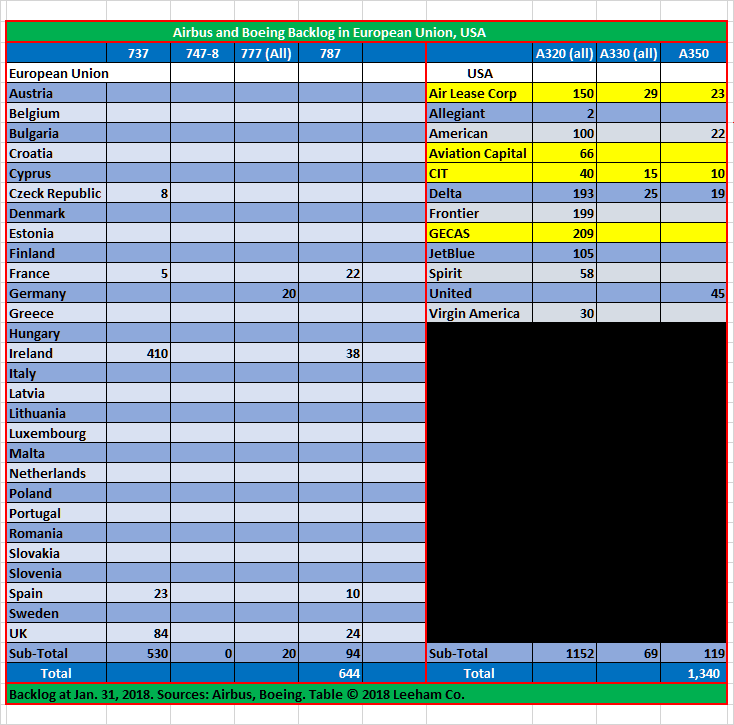 Boeing has considerably fewer orders outstanding in the EU than Airbus has to the US. More than 200 are to Irish-based leasing companies. As with Airbus, some of these aircraft will be destined outside the EU and unlikely to be subject to tariffs. The number of aircraft for Airbus and Boeing subject to potential tariffs will certainly be reduced by those delivered before tariffs are imposed. Presumably the Airbus and Boeing could repay the illegal subsidies and tax breaks and avoid tariffs if the respective appeals are lost. If the WTO appeals process upholds the original ruling that the Washington State tax breaks are illegal, he state is under contractual obligation dating to 2003 to replace the breaks with an in-kind amount. As it happens, a few years ago Gov. Jay Inslee proposed a carbon tax across the state to reduce the environmental impact of carbons. Boeing was exempted from this proposed tax. The tax didn’t pass the Legislature, but it’s back this session. Once again, Boeing is exempt from the proposed tax. This is believed to be the replacement tax benefit if Boeing loses at the WTO. If not, and the carbon tax passes this time, Boeing stands to gain a major windfall tax break. As usual, my head hurts. I thought that the current ruling was that the Washington State Tax breaks were legal? I thought EU was appealing that ruling. Doesn’t the current ruling stand until ruled (or not) otherwise? And the nutty game continues. Makes me want to go to the last page and read what happened. The suspense is killing me. Maybe I can to a RVW? Again more subsidiary to Boeing from US Gouvernement! Much worst the Bombardier! I hope Airbus will kill you in European market! >In the Bombardier complaint, Boeing conceded that the Airbus final assembly line in Mobile (AL) produces US-made aircraft. Very interesting. Boeing public statements were always that this was not necessary the case. I think what they were saying was that the A320 line produces US-made aircraft, but that the CSeries line would not necessarily be so. Cant be any difference between a Bombardier or Airbus plane from Mobile. What Boeing DID say about a Cseries from Mobile is that it ‘could be seen’ as an attempt to circumvent the tariffs already imposed and thus tariffs still apply. Tariff has been overturned and the CS100 can be imported from Montreal or Alabama. Considering significant parts of an A320/21 made in Alabama are Europe sourced, hmmm, but then A320/21 made under those dastardly Operand Socialists that (gasp) are almost communists and….. According to the Reuter’s story at the link after the quote below, USITC’s decision to not impose tariff’s on C-Series aircraft was based on their determination that Boeing lost no sales or revenue, because it did not offer any new aircraft to Delta to compete with the C-Series aircraft that Delta purchased. “The International Trade Commission published its reasoning three weeks after announcing the decision. The ITC said the 110-seat CSeries jets ordered by Delta (DAL.N) and Boeing Co’s (BA.N) smallest 737 MAX 7 plane do not compete. It also said Bombardier Inc’s (BBDb.TO) CSeries sale to Delta did not come at Boeing’s expense as the planemaker did not offer any new aircraft to the No. 2 U.S. carrier. “Boeing lost no sales or revenues,” the ITC said in its 194-page ruling. “The higher standard seating capacity of the 737-700 and 737 MAX 7 limits competition between those models and the CS100 for some purchasers,” it said. Common sense suggests that a replacement subsidy or windfall tax break would still be illegal. If Washington state and Boeing can defy common sense ,surely the Europeans can as well? Lack of investment at Airbus,vanishing management =really,really big fines on the way. Sure they wil darling, sure they will! Its remarkable how relaxed everyone is about the epic compliance fines companies like BP,Rolls Royce and most of the british banks have had to pay in recent years. Investing £10billion in an engineering project that will bring returns for 40 years scares the hell out of the city. Bonuses have been paid,pensions well stuffed and the guilty parties are allowed to quietly melt away. I have the feeling that you could develop a new airliner with the fines coming Airbuses way.